Sooner or later everyone has to pass the bustling capital of Kenya. With the International Airport Jomo Kenyatta most of the Safari experiences begin here. And Nairobi is always worth a visit. Despite its bad reputation and unflattering nickname “Nairobbery“, the continents 14th biggest city is a great gateway to Africas culture and lifestyle. If you follow the common sense, don’t run around showing off what you own (e.g. phone, camera, watch etc.) and avoid walking around the city at night, you will have a great time. But of course don’t forget, this is not Barcelona, Rome or New York. There are several ways to get from A to B here in Nairobi. Probably the best is using Uber. It’s cheaper than a taxi, safe and comfortable. Just download the app on your phone, choose your paying method (if you choose “pay cash” you need no credit card etc.) and call your Uber. You see the prize you are about to pay before ordering the car, so there is no bad surprise in the end. The cheapest and most interesting way of transport is using the typical kenyan Matatu. These private owned busses drive on fixed routes and just cost a few shilling, depending on time of day and distance you want to drive. It’s a great experience, but don’t use a matatu at night. Don’t rush through cosmopolitan Nairobi. There’s more to discover than you might expect. The elephant orphanage of the David Sheldrick Wildlife Trust is probably the most famous place in whole Nairobi. Founded in 1977 this Non-Profit Organization dedicated their life to the rescuing, nursing and releasing of orphans of all species. 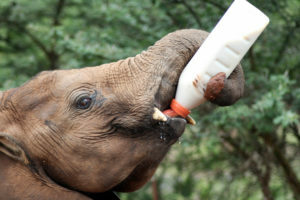 Around 90 milk-dependent elephant calfs are in the care of the nursery, which is situated in Nairobi National Park. Meat, especially Nyama Choma (which translates “Nyama” = Meat, “Choma” roasted”) is the most popular and beloved Kenyan dish and you should try it at least once. 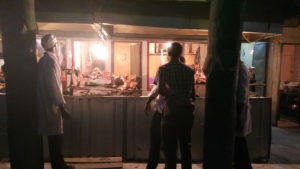 The restaurants, or better said, stalls, serve mostly goat “mbuzi”, but beef “ng’ombe” and chicken “kuku” are also available. The meat is barbecued and perfectly crispy. 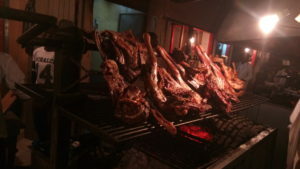 Once getting to a place, decide for one shop, choose a piece of meat directly from the grill and order sides if you want. 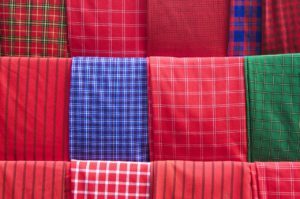 There are several places around town, best option: ask a local for the nearest option around you or visit Kenyatta Market for the “yummy” experience Mtongwe Rd, Nairobi. Where and when: Prestige Plaza along Ngong Road (Tuesday, Saturday), Capital Center at Mombasa road (wednesday), The Junction Mall along Ngong Road (Thursday), The Villagemarket along Limuru Road (Friday), Yaya Center along Valley Road in Hurlingham (Sunday). 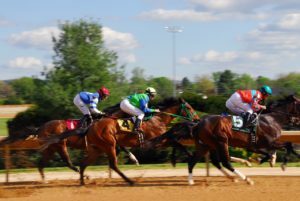 You want to get away from the bustling city and breathe some fresh air? 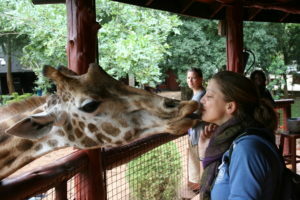 Nairobi has several parks on offer. Another great opportunity is a day or half-day trip to Karura Forest in the north of Nairobi. Rent a bike, visit the waterfalls and small caves or just walk around this big park. To get to Gate A take a taxi or matatu up to the Belgium Embassy at Limuru Road. The entrance is 600 KSH. 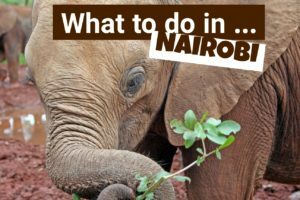 This entry was posted in What to Do and tagged arboretum, David Sheldrick, Elephant, forest, Giraffe Center, karura, Kenya, market, Nairobi, orphanage, park, shopping, Things to do, transport. Bookmark the permalink.